US Catholic Institutions and Immigrant Integration: Will The Church Rise To The Challenge? arises from a multi-year process led by the Center for Migration Studies (CMS) and the Catholic Legal Immigration Network, Inc. (CLINIC), to engage the leaders of diverse US Catholic agencies, academics and others on immigrant integration as a potentially unifying Catholic priority. 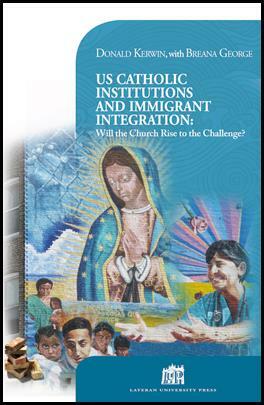 US Catholic Institutions and Immigrant Integration: Will the Church Rise to the Challenge? offers a timely reminder that we are all called to safeguard the dignity of immigrants and to provide opportunities for human flourishing and shared membership in the Catholic Church and society. To the Church, integration and communion are not about assimilating immigrants so that “they” become like “us,” but about an openness to the universal values found in diverse cultures and a willingness to change so that the table of the Lord truly provides Eucharist to all of us. The book describes programs and ministries that foster communion and serve as a blessing to the Church and to all of us, especially our immigrant brothers and sisters. May we always be willing to learn together as we rely totally on God regardless of our circumstances! Donald M. Kerwin, Jr. directs the Center for Migration Studies (CMS) of New York. CMS is a New York-based think tank and educational institute devoted to the study of international migration, to the promotion of understanding between immigrants and receiving communities, and to public policies that safeguard the dignity and rights of migrants, refugees and newcomers. CMS is a member of the Scalabrini International Migration Network, which consists of more than 270 entities that serve, safeguard and advocate for migrants throughout the world. Mr. Kerwin has also served as Executive Director of the Catholic Legal Immigration Network, Inc.; Vice-President for Programs at the Migration Policy Institute; Associate Fellow at the Woodstock Theological Center; and on numerous boards, advisory committees, and task forces. Breana George is CMS’s former research coordinator and served as the managing editor of the center’s public policy publication, the Journal on Migration and Human Security. She holds a Master of Public Administration degree in Public and Nonprofit Management and Policy from New York University. For orders of 10 copies or more, the unit price is $15.95 each. Shipments outside the US territory will be assessed an additional fee based on location. For international orders or additional information, contact cms@cmsny.org. All sales are final. Orders once placed cannot be cancelled.